This cheesy potato casserole is our absolute favorite! And, there’s a secret “extra ingredient” that we add in, which makes it extra awesome! See more potato side dishes here. Are you looking for the very best, best, best cheesy potato casserole? Congratulations! This is it, you have arrived! 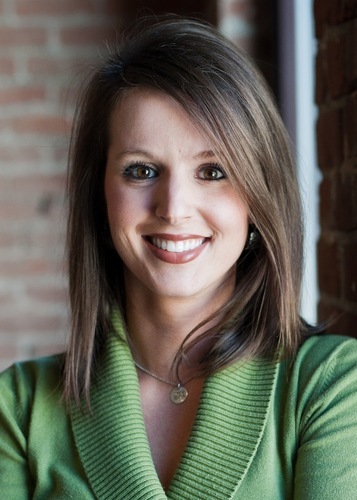 Now, imagine me standing with you probably in your office, or on your phone with a big bell. THIS is the potato side dish recipe that you most certainly need in your life and I’m ringing the bell. It’s probably the same in every part of the states, but I pick on Iowans… we always need a starch with our dinners. Having a steak on the grill? Then you need a potato side dish for steaks. Having burgers on the grill? Your burgers will most certainly be bored as I’ll get out if they don’t have a potato side dish for hamburgers, right? Easter dinner? There’s no better side dish for ham or side dish for Easter dinner than this cheesy potato recipe. Having pork chops? Well, pork chops are basically naked if they’re not served with this perfect potato side dish for pork chops. Am I right, am I right? Yes, I’m totally right. So, this has become our family’s go to potato bake recipe. But, I do believe wholeheartedly that some extra creamy soup, a little extra cheese and an extra dollop of sour cream are what makes this hash brown casserole different that it’s “cousins” if you will. I’ll get on to the Cheesy Potato Casserole and how I assemble this. Whether I ramble on, or not you’re sure to find out just how easy it really is, right?! I will usually let the frozen hashbrowns thaw for a little bit. 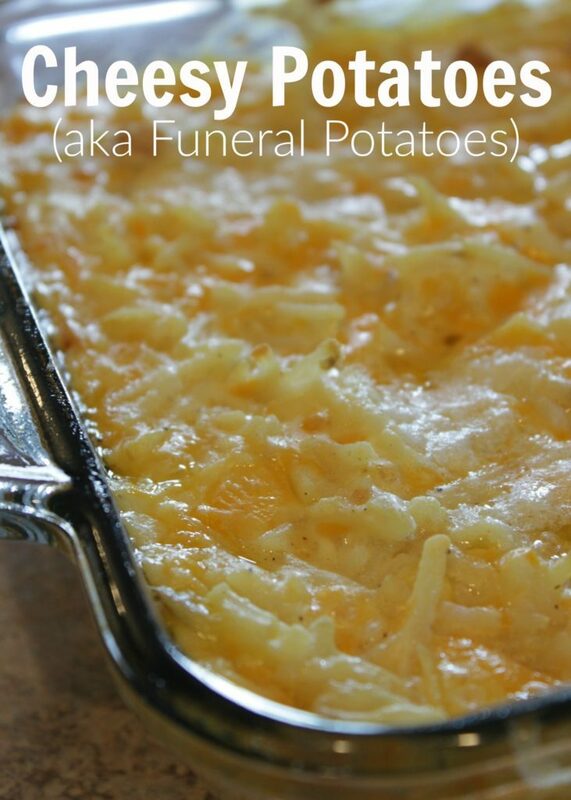 I have never made this potato side dish with “whole” potatoes, although I am sure you could. I am guessing it might be mushy because of the extra water from the potatoes, but if you decide to try this recipe with red potatoes or baking potatoes, do let me know if the comments, ok? 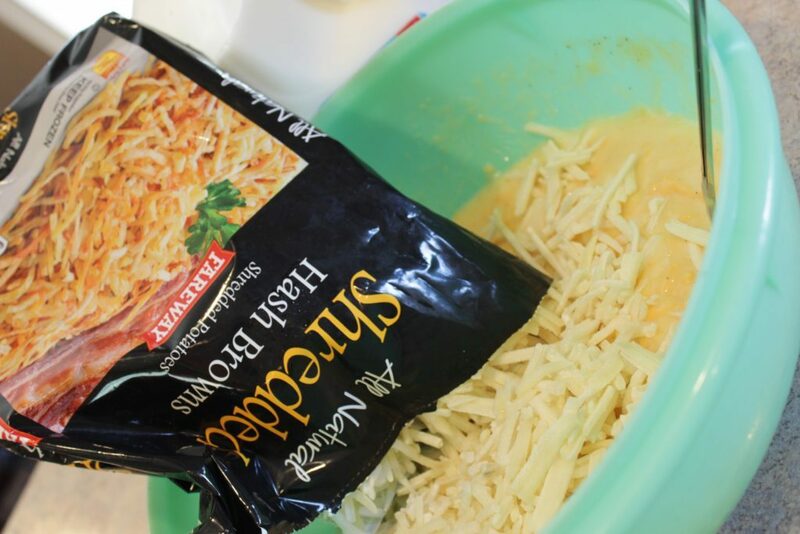 Once the hashbrowns have had a chance to thaw, you’ll want to gather your ingredients. This hashbrown recipe comes together super fast. And, that’s a good thing, because I just love quick & easy side dish recipes, don’t you? Combine everything except for the butter, and cornflakes which you’re going to pour over top. I added cornflakes in at the last minute because that is another variation of this potato dish. Albeit, amazing… but I didn’t use cornflakes as I was preparing this dish, so I didn’t think it was fair to add them in as required. Mix the soups, milk, sour cream and cheddar cheese in a big bowl like this one here. Next melt the butter and pour over the potatoes. Bake in a 350 degree oven for one hour. If you’re making this potato side dish with cornflakes, simply mix the cornflakes in with the butter and spread that over the top of the cheesey potatoes. You’ll have a fantastic side dish when you’re done! 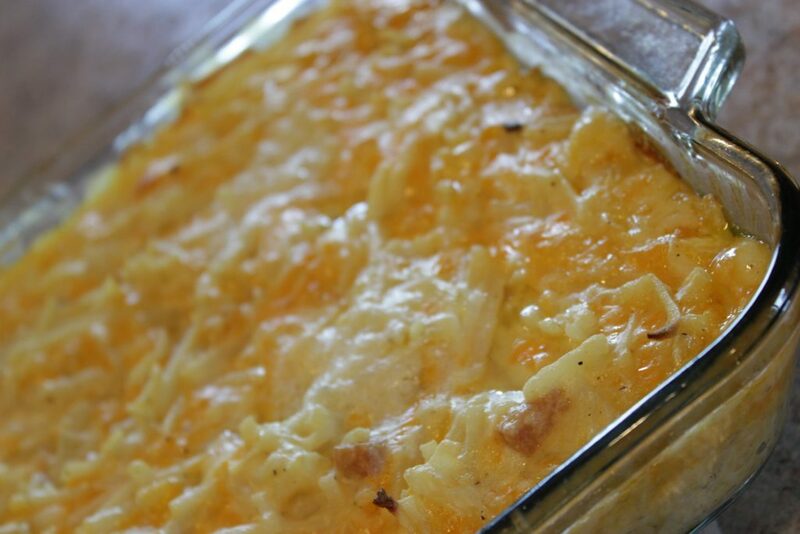 This cheesy potato casserole is our absolute favorite! And, there’s a secret “extra ingredient” that we add in, which makes it extra awesome!